If you are looking to sell a used car, you need to look no further. We make the process of selling a used car as simple as possible. You can certainly place an ad in the local paper and sell it yourself. 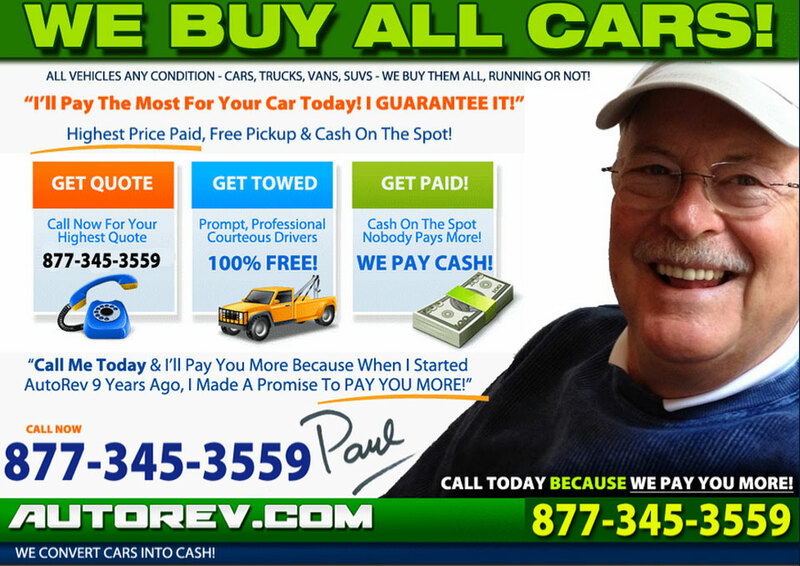 You can sell a used car to a used car dealer. You can even list your car on a web site and hope to field e-mails and phone calls from people with interest. Our business is thriving because we are the easiest way to sell a used car. We offer a fair price, we pick it up for free, and we show up at a time you choose, with cash in hand. Selling a car to a used car dealer is certainly possible, but almost never a rewarding or particularly profitable experience. If you set out to sell a used car through a web site or traditional local papers, you'll end up doing a great deal of work trying to field phone calls and set up appointments. We're the easiest way to sell a used car, we're the fastest way to sell a used car, and we're confident that if you place any value on your time, that you'll find us the most profitable way to sell a used car. If you call or e-mail us during normal business hours, we'll get back to you in a matter of an hour or two. If you are looking to sell a used car at night or over a weekend, we'll get back to you the next business day. We've worked long and hard to be fast, frank, and the most hassle free way to sell your used car.